Introducing … Charming personalized note cards adorned with hand-painted lettering and original watercolor illustrations! 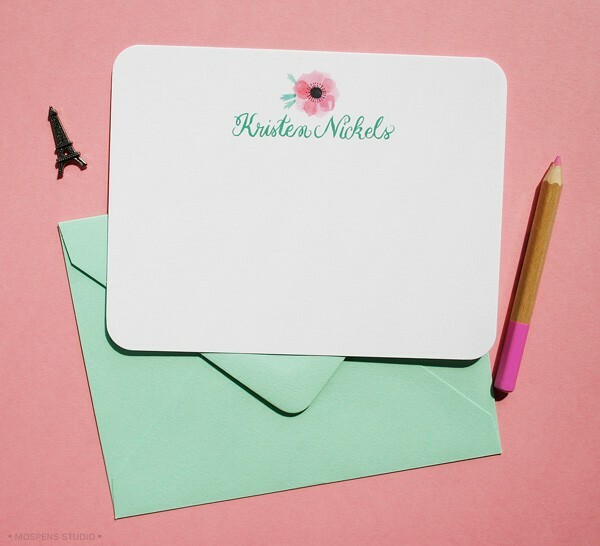 Today we are giving away 10 personalized note cards + envelopes to one lucky reader. See details on how to enter below! 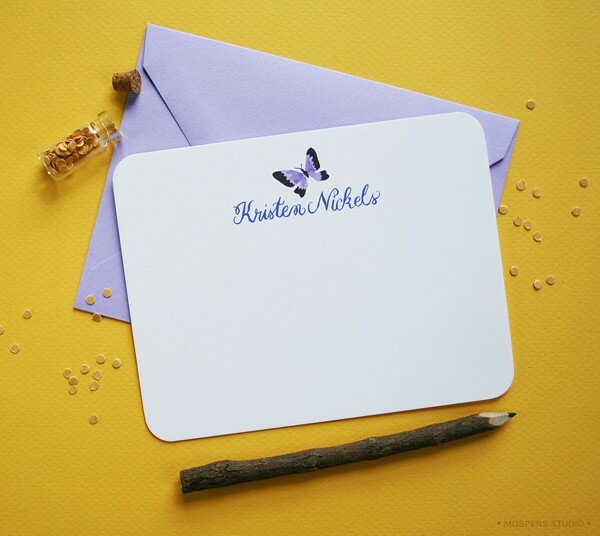 Each stationery note card set is made-to-order. 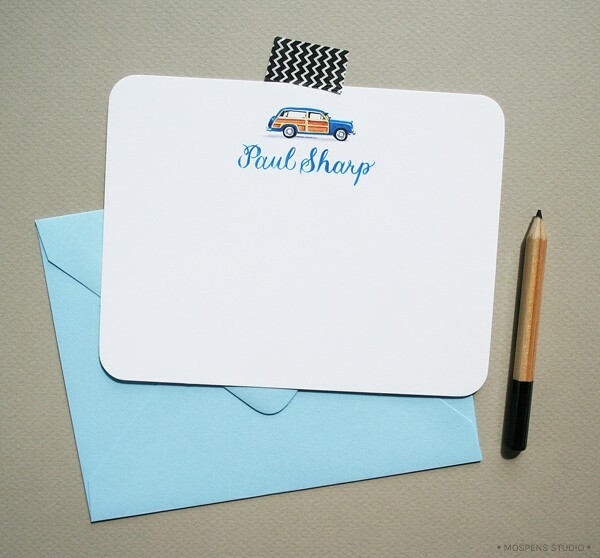 Watercolor flowers, vintage cars, and posh pups illustrations are included in our newest collection of personalized stationery notes. Find more whimsical note card designs in our Mospens Studio Etsy Shop! Stop by often to view the newest designs. 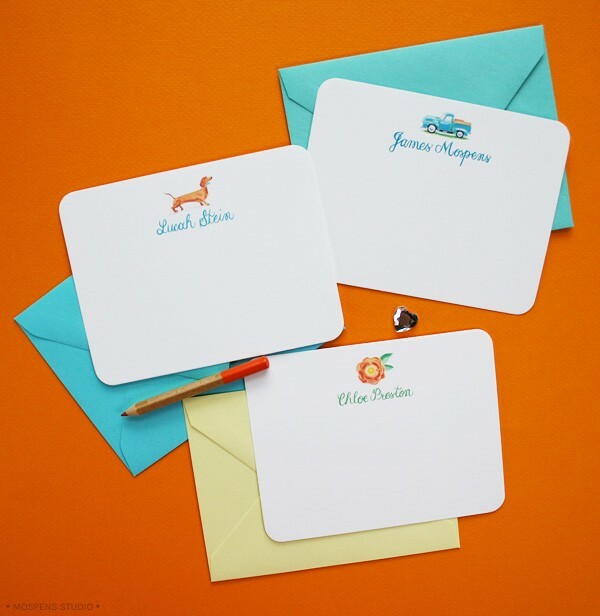 Our painted personalized notes are perfect for thank yous, notes, or just saying “Hello!” As always custom made-to-order illustrations are available by request. 2. Pin a photo from this giveaway post on Pinterest. Then, just comment here you did so. 3. Blog, Facebook, and Tweet about this giveaway and leave another comment letting us know! 4. Follow Mospens Studio on Facebook and Twitter and let us know by commenting here. Enter as many times as you wish! This giveaway ends on August 20, 2013 at NOON 12:00PM ET. USA residents qualify only. One random winner will be chosen to win one 10 pack of illustrated note cards with 1 design (from my current illustrated collection). I would love to see a hibiscus! Florals!!!! I love your flower illustrations!!!! Pinned and shared on Facebook! I already follow you on Facebook and found out about your giveaway. I adore your floral paintings and would love to own something hand painted by you. It would be fun to see you paint those cute little Macaron cookies. I’m not sure if you’ve already done those, cute shoes or wine glasses and wine would also be great! I would love to see some black eyed Susan’s! Shared on Facebook and following! Michelle you do beautiful work! Hydrangea Flowers would be pretty or something bridal for a bridal shower thankyou! Pinned ! CONGRATULATIONS TO Sarah Lindsay!!! xo Sarah, please contact me with the art and name you want printed on your custom personalized note cards!